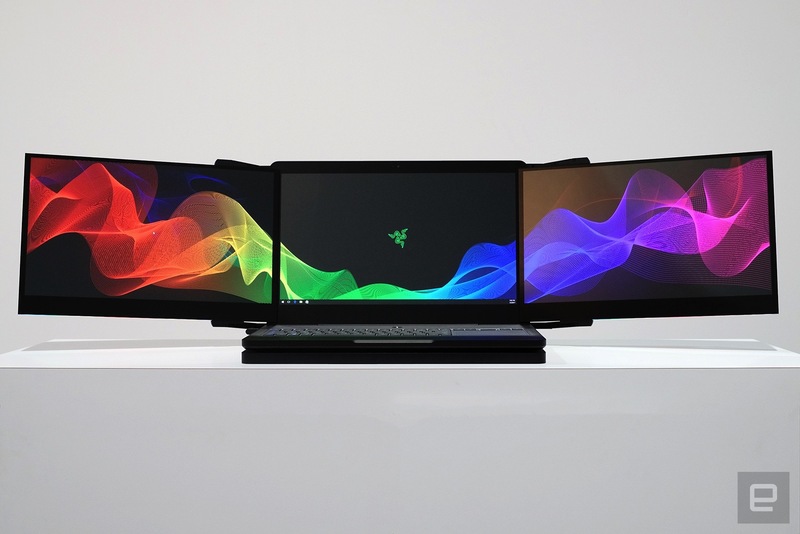 Razer built a laptop with three screens, because why not? Triple your monitor area, triple your fun. Multi-display setups are increasingly common for desktop gaming rigs, as they provide valuable extra visual real estate. But no matter how graphically powerful gaming laptops have been in the past, the onscreen action has always been limited to just that -- a single screen. At CES today, Razer unveiled a prototype that could change the way we play. 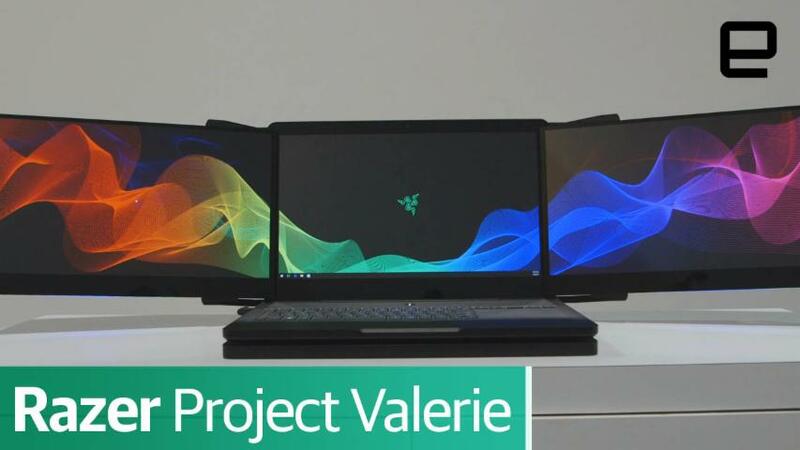 Behold: Project Valerie, the world's first laptop to incorporate three -- count 'em, three -- built-in monitors. Each screen measures 17.3 inches, with 4K resolution -- that's 12K total (11520 x 2160) viewing space. They slide out from the central lid chassis under their own power and autonomously position themselves to create a full 180-degree viewing area, powered by NVIDIA's Surround View technology, which enables programs to spread a single image across multiple monitors. All of the computer's wiring is internal, so you won't have to worry about snagging power cords as the screens deploy. The Valerie also utilizes Razer's short-throw keyboard, an all-aluminum case and the computing prowess of the 17-inch Blade Pro. That means it's fully compliant with the hardware requirements for both the HTC Vive and the Oculus Rift. Even with all that extra hardware, though, the Valerie measures 1.5 inches thick and weighs less than 12 pounds -- granted, that's pretty portly, even by gaming laptop standards, but not quite heavy enough to fully restrict it to a stationary role on your desk. There's no word yet on pricing, availability or even key specs like the CPU, GPU and memory. That said, we do expect to get hands-on with this thing here at CES, so perhaps we can glean more about the internals, at the very least.